A problem faced by administrators, especially those of smaller galaxy sites, is how to connect users with documentation on workflows and analysis procedures, and then helping them through running these steps. For sites where the admins and the tool developers are the same groups, finding time for developing the required training resources and providing the level of hands-on guidance required can be an impossible challenge in time management. Troubleshooting: When users have trouble with a tool, they can ask in chat if anyone can help, rather than coming to administrators and tool developers first. 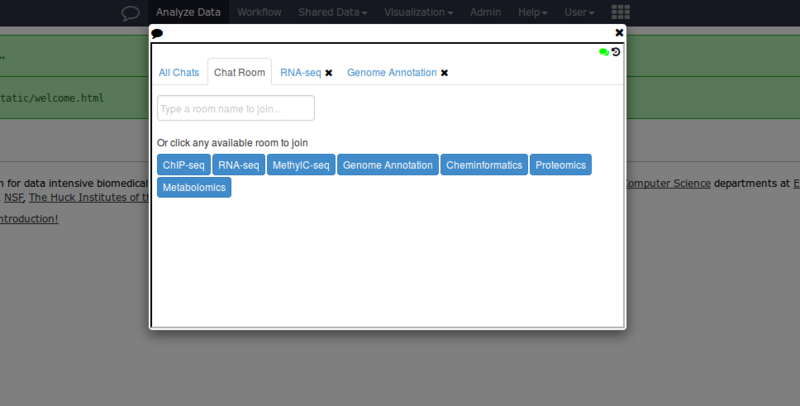 Dedicated Discussion: The chat implementation provides the ability to designate some fixed chat rooms which will always be visible to users, these can be used to help guide user discussion to topics like NGS. We say “access to galaxy database”, this service could run on an NFS mounted copy of Galaxy, if the host it is deployed on can access the database of the main galaxy instance. This is required, because the chat service validates connecting users to prevent impersonation. The chat server is a very new feature in Galaxy and has been disabled by default at a number of levels, as not all users may wish to use this feature. # persistent_communication_rooms is a comma-separated list of rooms that should be always available. As you can see in this configuration, it is pointing at a service running on the same host as Galaxy, talking to port 7070. Once you have configured this portion, you will want to install the required dependencies, and launch the chat server. This is run as a separate flask based service. Next we’ll configure user-level access. 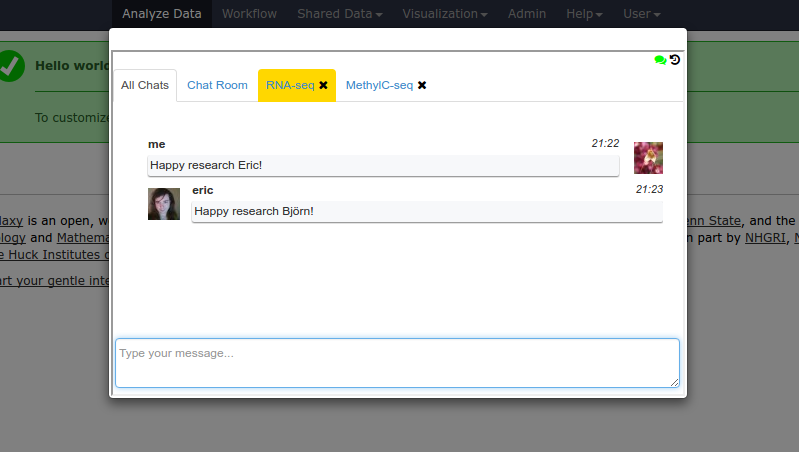 Users who wish to enable the chat can do so in their user preferences. After which, a new icon becomes visible next to “Analyse Data” on your Galaxy header. Opening the chat interface, lastly we notice that chat defaults to an offline state. Clicking the red chat bubble icon will turn it green and allow the user to engage with others. Finally users can connect with one another within Galaxy. Ensure authenticated access by decoding their Galaxy galaxysession cookie. Configuration with virtualenvs will be slightly different.